Historic Italian Hall as part of the new exhibit at the newly underway Italian American Museum of Los Angeles. When I moved into Temple City, an old-timer on my block told me how a group of Italian-Americans had lived on the block. They were part of the town then, back in the 1950s and 1960s, and still are today. Notables are the two Petrillos restaurants, one in San Gabriel and the other on Las Tunas Drive in Temple City. For my birthday, my wife, Karen, bought tickets to a dinner and fundraiser for the Italian American Museum of Los Angeles. The new museum will celebrate the contributions of Italian-Americans in Los Angeles. Most do not know that the area’s first Little Italy was established near Olvera Street and Chinatown. Today, the Italian Hall is being restored and the museum has begun limited operation of select exhibits. We had a great time speaking a little Italian to those at our table at Michael’s Tuscana Restaurant in San Pedro. And I might add, the pasta was al dente! The San Gabriel Valley tie-in comes from our region’s very own Italian-American in Sacramento, Assemblyman Anthony Portantino, D-La Canada Flintridge. He is listed on the program as an Honorary Board Member, along with legendary, L.A. political consultant, Joe Cerrell. Water gushing from the flood gate of the Morris Dam above Azusa. The picture was shot on March 25. The county Department of Public Works opened the flood gates of Morris Dam. The water is going down San Gabriel River and pooling at the percolation ponds surrounding the 210 Freeway at Irwindale Avenue. I’ve had calls on this before. Even wrote a piece in the newspaper. 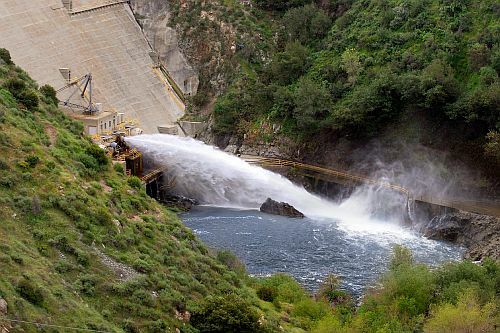 The pictures, supplied by Peter Rodriguez of the Upper San Gabriel Valley Municipal Water District, said the dam operator said the county has not lost a drop of water so far. For you water nuts, don’t miss the water seminar at the Courtyard Marriott in Baldwin Park on April 15, from 7:30 a.m. to 9:30 a.m.